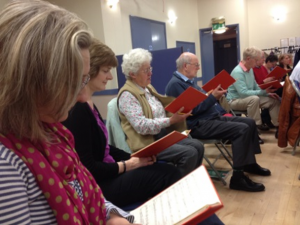 We are a mixed adult choir of around 20 voices performing in the Newport, Shropshire area and beyond. We love to encourage others to enjoy taking part, explore repertoire and improve their singing! Members come from a wide geographical area and a range of backgrounds and age ranges. We are an experienced choir with several long serving singers, but also many newer singers too. We sing to create beautiful music and for our own enjoyment. Our repertoire is broad, from sacred classical works to popular music arrangements. We rehearse on Tuesday evenings in school term time, at Cosy Hall, Water Lane, Newport (TF10 7LD), from 7:15 to 9:30pm. Subscriptions are £50 a term and this includes music and refreshments. Full-time students may be eligible for discounted subscriptions. The choir is interested in potential new members over the age of 16, so please contact us if you are interested. We invite visitors to experience a few rehearsals before considering membership and applying to have a private, informal audition with our Director.